What makes the Sterling TF gas heater better? 1. Tubular Heat Exchanger Other unit heaters available today are designed with the old clamshell style heat exchanger, positioned above ribbon-style burners. These are the most common points of failure, especially in the greenhouse environment. Heat exchangers invariably fail at the points where manufacturing processes have weakened the metal by stamping, crimping and welding. 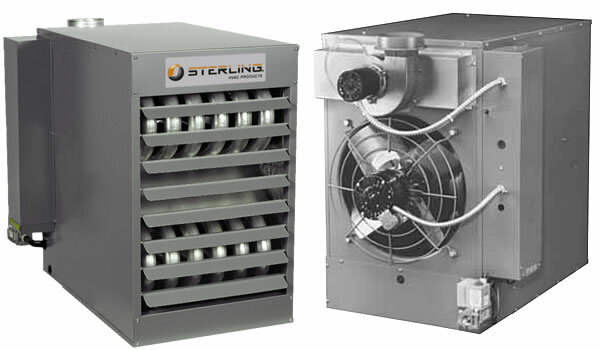 Sterling TF gas heaters are equipped with a tubular heat exchanger which consists of smooth, continuous tubes that are formed in a serpentine shape and then placed in parallel rows. This type of heat exchanger has no stress points (no points where the metal has been compromised) and no welds to rust (Most heat exchangers that are welded together are welded with metal that will rust even if the exchanger is made from a rustproof material) making it more durable than a similar clamshell heat exchanger and allowing the unit to be equipped with in-shot burners. 2. Advanced Burner Design Sterling TF's burner design is more akin to that of a fire-tube boiler than a unit heater. With these in-shot burners, the flame is retained inside the heat exchanger and fires down the inside of the heat exchanger tube. This design accomplishes three things: First, it eliminates the need for separate conventional ribbon-style burners. Second, it enhances flame quality and heat transfer; and third, it eliminates most burner corrosion problems. Conventional burners fail when moisture from condensation drips on them and are expensive to replace. This problem is eliminated with the Sterling in-shot burner system. 3. Direct Power Exhaust To ensure that your precious fuel dollars remain inside your greenhouse, warehouse, etc. and don’t end up going out the stack between heating cycles, the Sterling TF heater is equipped with a high quality blower to eject the products of combustion cleanly and completely. Since the exhaust blower is connected directly to the heat exchanger, minimal heat is lost through the vent stack unlike heaters equipped with clamshell exchangers. Horizontal venting also increases the heating efficiency of the gas heater by eliminating gravitational stack losses of heated air inside of the structure. The small cost difference between the Sterling TF gas heaters and conventional gravity stack units will typically be recovered in 12 months or less. When the TF units are called upon to bring heat into your structure, the induced draft fan will cycle on for approximately 30 seconds to “prepurge” any unburned gasses and to create the proper pressure for operating the in-shot burners. This fan operates at all times when the unit is running and will turn off after the desired greenhouse temperature is reached and the gas valve is closed. 4. Easy Maintenance Setup Removable side panels simplifies maintenance and suspension point adjustment. Sterling gas heaters are also easy to maintain. Sensors and controls are located in a central enclosed box mounted to the left hand side of the heater. This protects equipment from the elements and simplifies checking and replacing parts. Other manufacturers tend to place sensors and equipment throughout the heater making it necessary to remove entire heater panels or climb to reach the top of the heater to check them. 5. LED Diagnostic System Every Sterling TF gas heater has advanced diagnostic controls that monitor all primary heater functions for dependable, worry-free operation. If the TF heater doesn't start, a LED diagnostic light on the heater will flash indicating where the problem occurred and makes fixing the problem quick and easy. 6. Automatic Ignition Control 115 volt power supply and 25 volt controls. Limit control shuts off main burner to prevent overheating. Pilotless electronic direct spark ignition with safety redundant gas valve. 100% safety shut-off with continuos retry. Heater is automatically lit on call for heat, and there is no need to worry about the pilot blowing out and needing to be manually lit again as with standing pilot igniters. 7. Advanced Safety Features Sterling gas heaters come equipped with the most advanced safety sensors available. Each sensor is wired to the LED diagnostic system. The terimal board will flash when a safety sensor has been triggered and indicate which sensor (area of the heater) needs to be checked.